I read this some months ago but, inexplicably, failed to note the fact. Wildavsky is a clear, cogent and persuasive writer. He provides a good review of the global higher education picture and many of the key issues facing nations and universities. There is, unsurprisingly, plenty of coverage of league table matters and he helpfully provides a handy, and surprisingly long, list of countries which have league tables. Noting the general biases in international tables he highlights a number of additional models – PISA, OECD, AHELO etc – as well as alternative subject-based approaches. Further topicality comes from his damning indictment of visa restrictions and their consequences. Wildavsky mounts a welcome and powerful argument for free trade in ideas, scholars and HE and therefore against the constraint of movement of academic staff and students (as sadly we are experiencing in the UK at present). It’s a cogent and compelling line. So, overall, a thoroughly readable and engaging text. My main criticism would be though that lots of this is rather US-oriented, and the NYU material and Sexton discussion is largely prospective. The author seems too willing to accept as yet unrealised institutional plans for international growth at face value rather than looking in detail at what some institutions, for example the University of Nottingham in China and Malaysia and other UK and Australian universities, have successfully achieved in Asia. 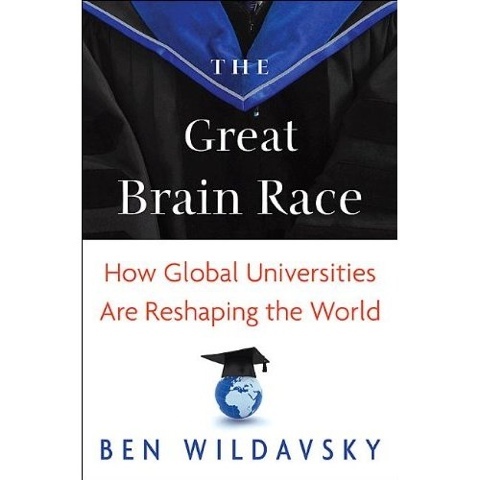 This entry was posted in Admin, Book, HE, international, League Table, Management, ranking, Review, University, University of Nottingham and tagged Ben Wildavsky, HE, international, League Table, NYU, ranking, The Great Brain Race, universities, University of Nottingham, world by Paul. Bookmark the permalink.